"The best kept secret in High-End Audio today!!!" About the amps. Wow! They sound fantastic!!! It is like the “old” NuForce Ref9 SE’s after steroid treatments. Everything I loved about the amps has been amplified (no pun intended). The base is deeper, sound field is wider, midrange is warmer and the dynamics more pronounced. It is like I purchased a brand new pair of mono blocks - not just having “upgraded” some old ones. Moreover, the modified amps produce a sense of more amplifier power with even darker backgrounds... As the circuits break in, the sound keeps improving... WOW!!! Nothing but non-stop TRUTH and BEAUTY !!! With the new power supplies, the amps have taken quite a bit of break-in... I want to give you some initial observations. First, the amp has so much more dynamic range... The amount of bass drive is amazing. It is as if a sub-woofer has been installed into the system! Not just more bass but clean, defined and more realistic toe tapping sound. I also detect a bit less sibilance in the midrange, ever so slight but really in a good way. Sound-stage is a bit more forward, but a tad wider than before. The music really draws you in and gives me the desire to listen for long periods at a time. 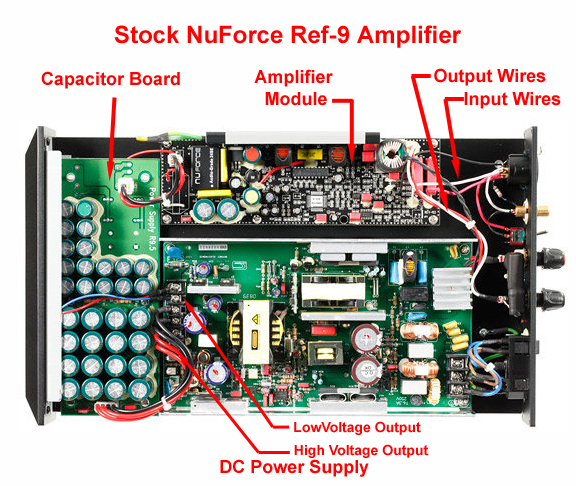 If you happen to have a pair of Ref-9s, 18s or 20s that either aren't working and/or you are looking to make a move up to better performance, rather than delegate them to a landfill or sell them at a significant loss you might consider letting us "transform" them for you into an amplifier capable of such improved performance that you might not even recognize them for what they once were. If you don't own a pair, hurry up and go get a couple of used ones before the word gets out and their price starts going back up. Trust us... it's GONNA HAPPEN because word travels fast when you're talking deals like this. Oh... and speaking of "deals," unless you are quite "well to do" you probably won't be able to afford what it would otherwise cost to replace them with anything else as good either... let alone better. OK, we have now warned you. Don't blame us if a used pair of NuForce Reference Series amps start becoming rarer than hens' teeth and/or their prices start going through the roof. we're gonna keep "do'n R thang," and if that drives up their price... oh well - you had your chance. 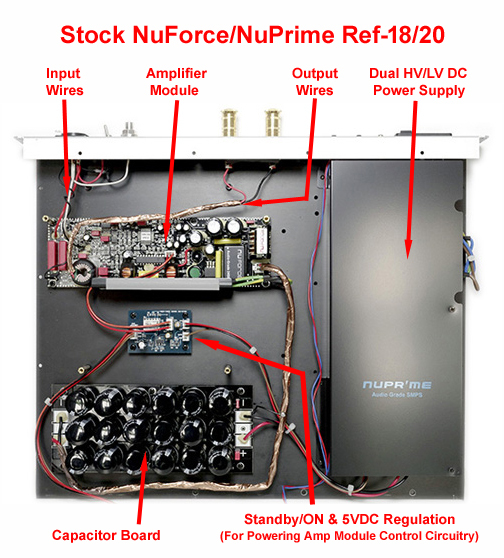 If you already happen to own a pair of NuForce Reference Series amps (or even a recent NuPrime version of the Ref-20) and you're in the market for a SERIOUS step up in performance and reliability, you really owe it to yourself to to take a serious look at our new Level-2 & Level-3 Power Supply upgrades. In fact, you can easily pick up a used pair of Ref-9s these days for $1.5K, and often less. Then get the Level-3 Power Supply Upgrade (D.R.R.T. & Level-2 included) installed for another $2.4K, and end up with a pair of amps that sound like they should easily cost over $20K... for less than $4K!!! That's nearly the price of a single stock NuPrime Evolution One alone! As far as sonic performance goes, (in our opinion) there isn't an amp out there that can even come close to competing with that combination for less than $8K, so we're talking about one of the "best kept secrets" in high-end audio today. You can rest assured that if you do decide to "go for it," it will likely be a long time (if ever) before you're in the market to replace them. In fact, as is often the case with any truly exceptional piece of audio gear, they may very well be the last amplifiers you'll ever own. So it was that TDSS began offering our Custom Upgrades (D.R.R.T.). They were fast becoming a great "hit" with nothing but rave reviews following, so realizing their potential we began offering them for all of the NuPrime products as well. Along the way though we ran into a bit of a "snag," at least with respect to the older legacy NuForce Reference Series amps.